A stylish, knitted knitted scarf with a hoodWill be the decoration of any women's wardrobe. I wonder how long there is an original cape on his head and to whom women are obliged by the appearance of a fashion trend? The prototype of the modern hood, most likely,Was a knight's helmet, the prerogative of strong men. However, already in the 11th century the clergy wore cloaks with a special cape for the head, which was not too different from the modern version. In the 13th century, secular ladies drew attention to the hood. Especially popular was the model of large size with special ties, which allowed to wrap the head in cloth, creating the semblance of "Turban". During the following centuries, stylesRepeatedly changed. However, the main purpose of the hood was to hide from the cold and a curious foreign view. Gradually, an important once part of the wardrobe began to lose its importance and in the 20 th century almost disappeared. Many fashion connoisseurs believe that this is due to the development of feminism. Women themselves began to abandon the "Ladies'"Tricks, trying to level oneself with men even in the wardrobe. Therefore, by the end of the 20th century, a knitted coat with a hood became a real rarity. There were mostly sports models. Nevertheless, during the last couple of years, it is noticeableIncreased interest in the undeservedly forgotten part of the wardrobe. Fashion houses increasingly include in their shows a trend, moving away from the sporting style and presenting really graceful things to women. Not every skilled worker is able to tie a fashionable cardigan. But, the knitted hood is in force even for a beginner needlewoman. Perhaps, therefore, the scarf-capor began to enjoy extraordinary demand. Which trends are relevant this season? An interesting variant is created with the help of a separate brightly colored detail. You can tie a monophonic cap scarf, decorating it with pompons of contrasting colors. 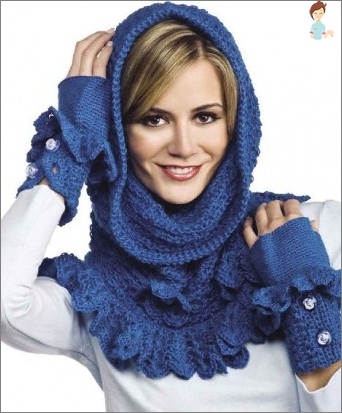 Of course, to buy a ready-made knitted sweater withHood is much easier. That's just not excluded that this model will not be present in the girl's wardrobe. Completely original look looks like the options themselves. To work, you will need straight needles No. 10, as well as a darning needle. It is better to use for wool wool or angor yarn, which will need at least 800 grams. When the length of the cloth for the hood reaches 39 cm,The remaining 31 loops are closed in the form of facial on the wrong side. Folding the fabric in half, the loops of the last row are stitched using a darning needle. A warm and incredibly cozy knitted hood withScarf is ready. It will reliably close the ears from the wind, and warm even during the Siberian frosts. And you can decorate the model with tassels or pompons, tying them to the edges of the scarf.